Well, my friends. The Summer of Change is now over, but I do hope that you have embraced at least a part of what I've shared with you. Taken it into your heart and mind and tested it out, finding what works for you and what doesn't. I've used all the hints I have given you. I studied Neville Goddard and Florence Scovel Shinn. I took what worked and cast off what didn't. And I'm now living the life I wished for. To use a quote from one of my favorite TV shows of all time. Since some of you have asked, I have compiled the entire Summer of Change into a book you can have on your eReader at all times if you'd like. When we start down the path of enlightenment, we get on a roll. Every issue from our past that we fix, we see a direct and positive change in our future. We go “wow!” look at that. And don’t get me wrong. That’s a GOOD thing. It changes our focus from our dreams to our problems, which is the exact opposite to what we should be focused on.It tells the universe we want more problems to fix. And the universe, in all its nicety says, “Okay, if that’s what you want…” And hands us more problems, more issues, more nightmares to fix. And now the time has come. 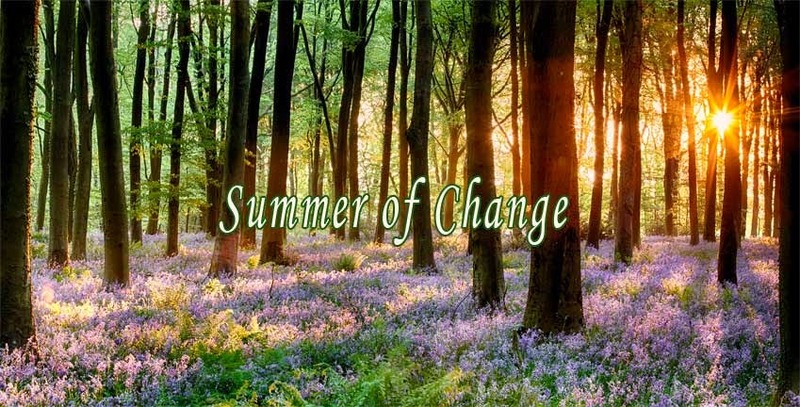 The Summer of Change is almost up, but your change has just begun. You have read and studied the gurus and worked at raising your vibration so that you are in more alignment with what you want and who you want to be. Now it is time to become your own guru. It’s a simple and easy thing to do. First off, you must understand that teachers are only telling you that which works for them. They come from different backgrounds, have had different experiences from you. So what works for them, may or may not work for you. And you may find by tweaking their suggestions that you can get them to really work for you. Listen to your intuition. Let it guide you. If something doesn’t work? Either move on to something else, or tweak it until it does. This is, in essence, becoming your own guru. All right. Today’s the day. Break out the baskets, garbage pails, and gloves. It’s time to de-clutter. Why de-clutter? Because our physical lives do tend to mirror our emotional ones. If our physical space is cluttered, it shows how much our emotional space is muddled as well. Plus, if you are trying to attract some ‘thing’ and there is some other ‘thing’ sitting where the new one will go…how will it ever arrive? Clear out a spot for it. Now, the general rule of thumb is to look at everything and think “Have I used this in the last year?” If not? It goes. Stuff in good shape can go to the library, hospital, good will, church bazaar… Stuff in bad shape goes into the garbage pail. Today is the day to love your partner. Or child. Or parent. Or…well, choose one. Now, I’m not talking about loving them the way you think they should be loved, as in “I feel loved when someone puts the bloody toilet seat down so he had better do so.” That isn’t loving. That’s controlling. What’s loving? Ask the person what makes them feel loved. Do they want you to go with them to a local basketball game? Go fishing with them? Head out for a 2-day campout? Walk hand-in-hand with them around the mall for no apparent reason? Try a new sexual position? Find out what you can do to give them that feeling. And then figure out a way to do it. Let it go. Stop obsessing. Stop worrying. It wasn’t yours in the first place. As humans, we tend to worry or stress about a lot of inconsequential things that we have absolutely no control over. Well, the fact is, we do have some control, we just don’t know how to wield it. And our control is not over the circumstance as much as the end result. And our worries, obsessions and other harmful emotions just push our goals further away from us. If you worry you'll get sick? Chances are you will. If you worry your significant other will leave you? Chances are you will push them away. So let it go. It no longer matters that your neighbor gossiped about you and said some nasty things. Stop thinking about it, let the anger go. As long as you concentrate on it, you will just attract more of that kind of negativity into your life. The more you let it go, the less you’ll see. Today I want you to do something for you. Just for you. To help reenergize that amazing body and mind you have. Take a walk. Read a book. Relax in a bubble bath. As the spouse/partner to watch the kids while you go out with the girls or guys. (as long as that isn’t something you do all the time.) This isn't about escapism. This is about filling yourself up with what you need. Remember this is about rebuilding your spent reserves. …and the options are endless. The main thing is you want to do something that makes you come out feeling relaxed, rejuvenated, and excited for the next event in your life. Never forget to pamper yourself from time to time. Time is a human construct. It doesn’t actually exist. As a human that is one of the hardest things to grasp. We learned linear time from the time we were children. We know there are 60 seconds in a minute, 60 minutes in an hour, 24 hours in a day and so forth. And yet…time doesn’t actually exist. We made it up. We believe in it, so in a way it exists for as long as we believe it is true, it will appear to be so. But when we step out of time, refusing it to run out lives, and realize the universe does not work in a timely manner because there is no time ‘out there’, it opens up a whole new avenue of possibilities. Now that you’ve practiced helping someone you know, it’s time to test out this good samaritanism on a stranger. Let someone change lanes in front of you. Allow the person standing behind you at the checkout line to go in front of you because they only have three items and you have twenty. Or how about purchasing a few carnations, having them wrapped in paper and handing them out throughout your day? As always, follow your intuition. It will point you in the direction of the person who could get the most from your kindness. And soak and revel in that joy. Yes, it is okay to feel good for doing something nice. It is absolutely all right. The only time to stop is if ego steps in and starts strutting around.